Prohibited Noxious weeds are plant species that are designated in theAlberta Weed Control Act. Prohibited noxious weeds must be destroyed when found, meaning all growing parts need to be killed or the plant's reproductive mechanisms need to be rendered non-viable. 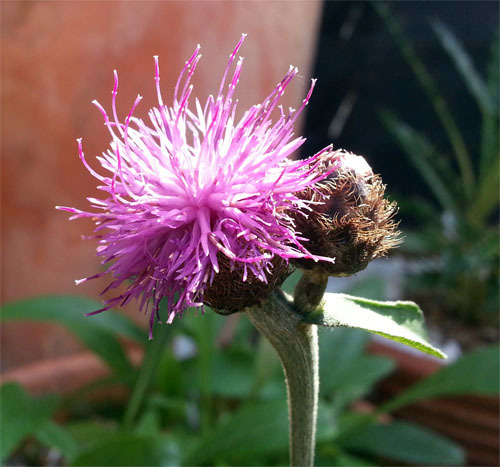 Black Knapweed is native to the Mediterranean and has become naturalized throughout Europe. In the 1900s it was introduced to North America as an ornamental species. Black Knapweed can invade open forests, grasslands, and prairies. It can out-compete native vegetation, reducing biodiversity and forage species. It can make chemicals that inhibit the growth of nearby plants. The 20-30 mm wide flowers of Black Knapweed lack larger peripheral petals and look more like thistle flowers rather than typical knapweed flowers. Usually purple, the flowers sometimes are white. The bracts (small leaves immediately below the petals on the flower head) have a dark hair-like margin that gives the bracts a black appearance. These fringe hairs are longer than the width of the centre of the bract. The leaves are lance-shaped, up to 25 centimetres long with a stem at the bottom of the plant, but get shorter without a stem near the top. Leaves can be straight edged or slightly toothed or lobed. The leaves and the stem are covered in stiff hairs. The seeds have lengthwise stripes along the body and a short tuft of bristles on one end of the seed that sometimes falls off. Black Knapweed grows up to 150 cm tall. Besides seed production, this knapweed also reproduces via rhizomes (underground rootstalks) making it a successful invader. Other Knapweeds - Centaurea species - but the main distinguishing characteristic is the black bracts around the flower bases of the Black. Other Knapweeds - Centaurea species - but each type has a unique bract characteristics which will be the determining factor in identification. 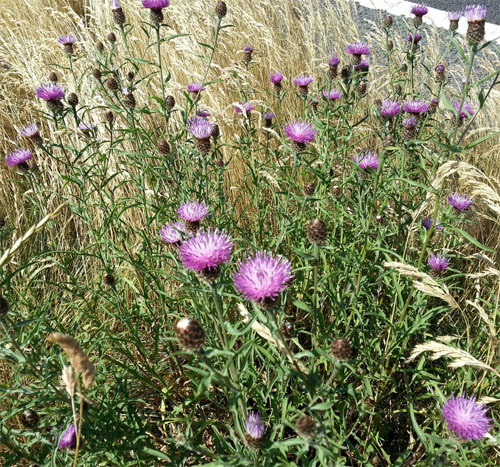 A number of knapweed species had been listed as prohibited noxious in Alberta.